Welcome to the Ashland County Law Library. We are located on the second floor in the historic courthouse in downtown Ashland, Ohio. We are open to the public Monday through Friday from 8:00 a.m. until 4:00 p.m. and closed for lunch from 12:00 until 1:00 p.m.. All state and federal holidays are observed. We are staffed by a full-time librarian. The Ashland County Law Library serves the legal and law related information needs of statutory users, including judges, attorneys, and county and municipal officials. The general public is welcome to visit the library and can be directed by the law librarian to particular resources. Our collection is for reference only and may not be checked out by the general public. The Ashland County Law Library provides a number of resources to our patrons, including access to both Westlaw and LexisNexis. We have two conference rooms that can be scheduled in advance. If no group is scheduled, both rooms are available as needed. Our book collection consists of over 10,000 bound volumes and a large number of periodicals. The collection is not available to the general public to check out but may be used in the library. In addition to our print media we offer two legal databases for the use of members of the bar. We have three user stations for accessing primary, secondary and search materials for Federal and Ohio jurisdictions. The library offers for the use of members of the bar several anatomical charts and medical diagrams for use in the courtroom. We also have a set of bones representing the human spine. 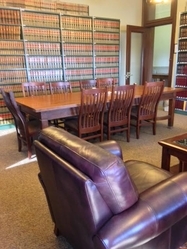 The library offers free document, book, or search delivery to local members of the bar. Patrons may copy and print at no charge. The librarian is pleased to help members of the bar research items online or to schedule Westlaw and Lexis training for you at your convenience. Need an obscure article or appellate brief? The librarian maintains a valuable contact with other libraries and other librarians. We have access to enormous databases and can provide you the information you need through email or by actually checking a book out of another library.